"Duck Dynasty" reality superstar Phil Robertson has been the top news story in virtually all the mainstream media this week. His comments in an interview expressing disapproval of homosexual behavior (while not overtly condemning those who engage in it) have stoked a firestorm resulting in a threatened suspension from his TV show's network, followed by a rapid reinstatement after popular backlash. I watched a few episodes of the show on Netflix earlier this year and found it charming. I could easily see why the show is such a hit, but wasn't moved to continue watching it myself. I am no conservative: I don't hold Robertson's position on homosexuality. As long as he has not advocated force or violence against any parties, he has not violated the libertarian non-aggression axiom. He is not, unlike stars of PBS programs, funded by taxpayer money. As far as I'm concerned, whether his show continues is entirely a decision to be made by the market (the market has decided overwhelmingly in his favor and I have no problem with this). 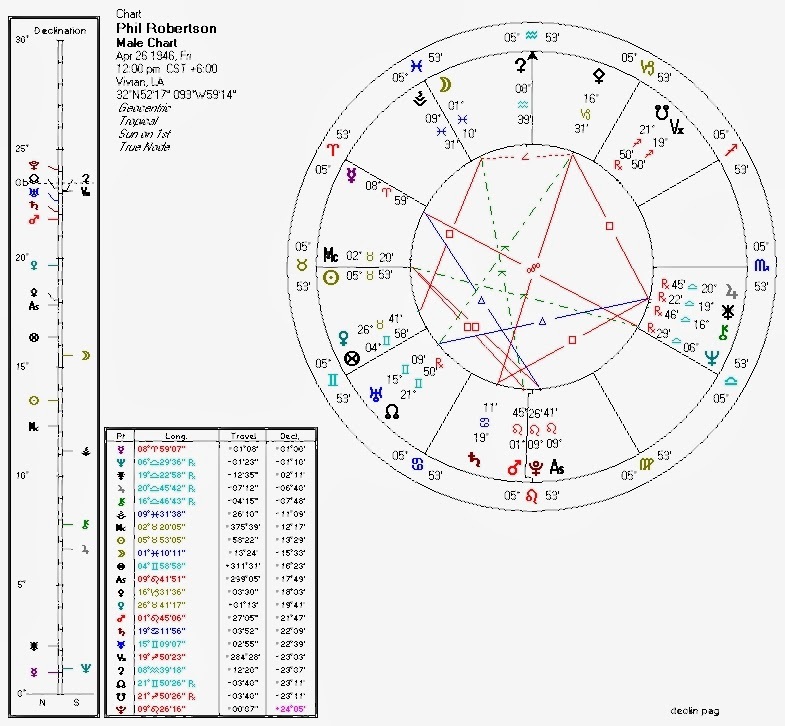 Robertson's astrological chart (no birth time) is of some interest. Pallas/Ethics: Pallas is square Jupiter and more widely square Mercury. Robertson doesn't seem particularly libertarian or authoritarian on this chart. Venus/Second-House/Economics: Venus in Taurus, with no connections to Neptune or the South Node. That suggests (probably) conservative leanings in the economic department. The North Node in the solar Second House reinforces this idea. No surprise here, given Robertson's success in business through the creation of a tangible product (as opposed to Neptunian banking trickery) and his openly conservative leanings. Moon/Culture: Possibly no connections between the Moon and Neptune (unless he were born later in the day, giving us a quincunx). Were he born in the morning, that would put the Moon trine the North Node and away from the Left-leaning influence of Neptune. This would easily explain his strong cultural conservative stances. The quindecile from the Sun to retrograde Jupiter in Libra perhaps represents how his "backward" social (Libra) ideology (Jupiter) might cause him some inconveniences (the quindecile to the Sun). Transiting Jupiter in Cancer (public sentiment regarding family) is currently squaring Robertson's Jupiter (his personal ideology again) and Chiron (wounding, requiring adjustments), and conjoining his Saturn (a struggle, eventually resulting in this case in expanded authority). No surprises here. The beauty of the astro-political classification system I use here is that once you understand how it works (because of or despite my writing), it's not very hard to see how the socio-political/economic battles of humanity are simply people acting out their planets. To see and understand that is to be more forgiving of the ways in which others differ from us, as long as they do not encroach upon our capacity to live our own lives as we choose. This understanding and forgiveness make us, well, more libertarian.